When it comes to fun and illogical innocence the first thing that strikes our brains is school days. Yes! we’re dumb, we’re worried, we’re fools, but we had fun. That was literally the best period of life for any person. When worried, a little token of memory related to our school days is more than enough to bring a smile on our face, such is the beauty in school days. Exams are quite obviously the best of all, the by heart techniques, the friend who becomes our teacher just for the sake of exams, and the silly punishments tied with score targets is totally real fun. 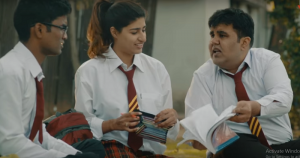 Here’s the video from the popular facebook channel ‘Timeline Videos’, they released a video featuring three students who are extensively preparing for their upcoming exams. The video has gone viral on social media, both YouTube and Facebook. The cast and crew behind the video also announced that this is their first video and they’ll be releasing few more videos in the coming days. Right at the completion of the video, the cast and crew wished good luck to the students who are going to give their CBSE Boards and SSLC examinations. The video garnered more than 523K views and 27K likes till now.